Hanover, August 11, 2015. 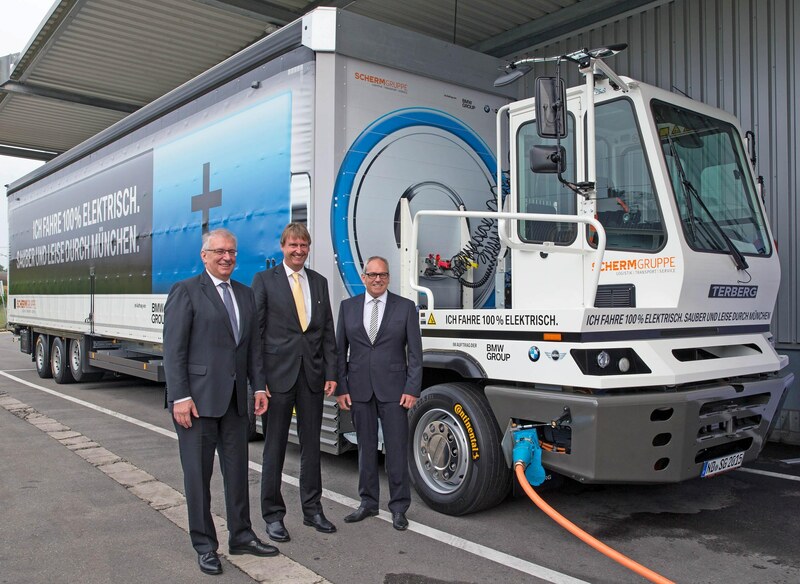 Continental is supporting a joint pilot project between BMW Group and its logistics partner SCHERM Group to promote environmentally friendly trucks. As part of the project, the German premium tire manufacturer is equipping a Terberg YT202-EV electric truck with its innovative 3rd generation tires and the integrated tire pressure monitoring system ContiPressureCheck™. The steering axle of the electrically operated truck is equipped with the Conti EcoPlus HS3 tire in size 355/50 R22.5, which features optimized rolling resistance. The Conti EcoPlus HD3 in size 295/55 R22.5, used on the driving axle, makes the ideal partner. The semitrailer of the e-truck uses Conti Hybrid HT3 trailer tires in size 445/45 R19.5, which offer optimized rolling resistance and long service life. Jürgen Maidl (from left), Head of Logistics at BMW Group, Kurt J. F. Scherm, CEO of SCHERM Group, and Hermann Bohrer, Head of the BMW Group Munich Plant, give the e-truck the starting signal. The e-truck has been traveling between the SCHERM logistics company and the BMW plant in Munich several times a day since the beginning of July, delivering modules for vehicles such as shock absorbers, springs and steering gear. The environmentally friendly truck operates very quietly thanks to its purely electric drive train. The road-approved e-truck, which will pave the way for more electric mobility in goods transportation, was presented in July at an official ceremony by Ilse Aigner, minister of state of Bavaria. 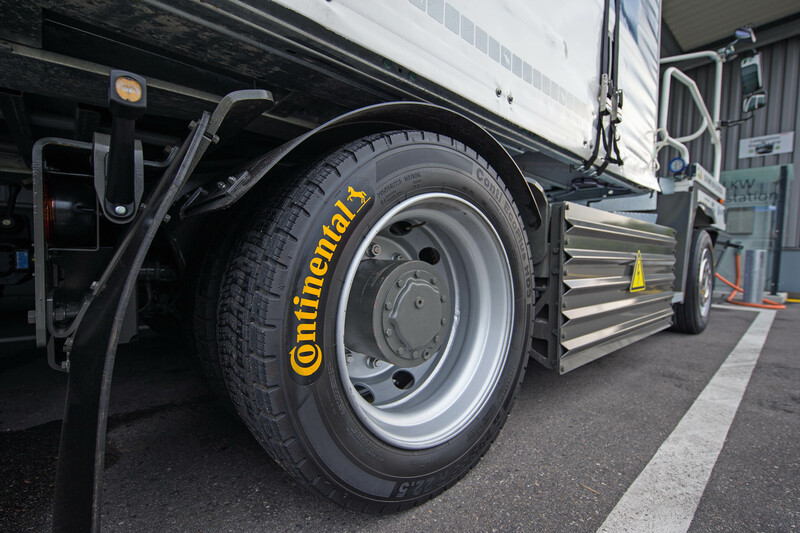 Fitted with the Conti EcoPlus HS3 and Conti EcoPlus HD3, the electric 40-ton truck transports goods using Continental's range of tires with optimized rolling resistance. The special tread design of both tires significantly reduces rolling resistance, thus greatly reducing consumption even when running on conventional fuel. The Conti Hybrid HT3 R19.5 tires that are used on the e-truck semitrailer were specially developed for combined use on regional roads and highways. With a long service life they are ideal for the frequent starting and stopping experienced in urban traffic, as well as the cornering encountered in residential areas. The tire, which also has optimized rolling resistance, was awarded the EU label "B" in the fuel efficiency category. The environmentally friendly e-truck is on the move with Continental tires with optimized rolling resistance and long service life from the Conti EcoPlus and Conti Hybrid ranges and is equipped with the integrated tire pressure monitoring system ContiPressureCheck™. Of course the correct tire pressure is also very important in order for the e-truck to run efficiently. The ContiPressureCheck™ tire pressure monitoring system monitors the tire pressure of the electric truck in real time and continually sends current data on the pressure and temperature of all tires to the cab. The quality of the tire carcass can be negatively affected by underinflation, but if the structure of the carcass is maintained with the correct tire pressure, it can be retreaded without any problems when the tread pattern is worn out. By preventing punctures and maintaining the value of the tire carcass, ContiPressureCheck™ improves the carbon footprint of transportation companies and makes a positive contribution to sustainable and environmentally friendly goods transportation. SCHERM Group is a globally active systems provider. It delivers solutions in the areas of logistics, transportation, real estate, and services. A service company operating throughout the value chain, it has around 2000 employees in 14 locations and on a mobile basis in around 500 of the company's own trucks. The company has defined sustainability as one of its core values.